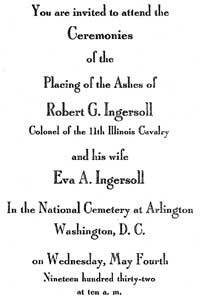 The ashes of Ingersoll, who died from a heart attack on July 21, 1899 (just 2 weeks short of his 66th birthday) and his wife, Eva (Parker), who died 24 years later, were buried in a grave, on May 4, 1932. Nothing is grander than to break chains from the bodies of men — nothing nobler than to destroy the phantoms of the soul. 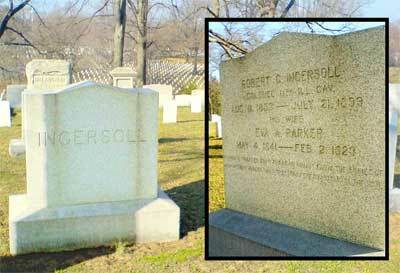 The grave site, in Section 3, Number 1620, can be visited by taking a cab or private car to Arlington National Cemetery visitor’s center, where one must go inside (with the grave number, the car’s tag number and state) to get a vehicle pass and a map. With this pass and a map, drive past the security guard at the entrance to the cemetery and proceed to the gravesite. Or, from the Visitor’s Center, take the Tourmobile ($8.50) to the “Tomb of the Unknowns” and stop and walk approximately one half mile to the grave site. 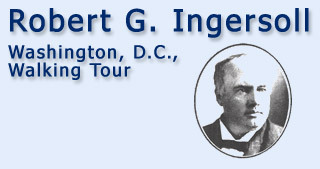 © 2011 WASH, Washington Area Secular Humanists. All rights reserved.